High Sleeper beds are great space savers and the perfect bed for 6+ years, providing a multi-functional solution for your child’s bedroom. 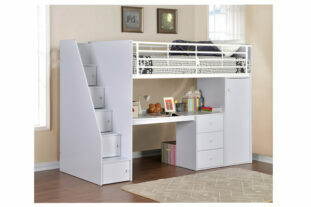 With a raised sleeping area, the area beneath the high bed can be utilised for children’s storage, study and sleep. High sleeper beds for kids from Room to Grow offer a stylish, space saving solution whilst also providing optimum comfort. Children’s high sleeper beds are both practical and attractive, coming in a variety of designs, colours and with various storage options. From minimal and modern to fun and colourful there’s a style to suit older children’s preferences. High sleeper beds offer a large space which is suitable for a large amount of storage such as wardrobes, drawers, kids desks and seating. It is personal preference as to what you choose to incorporate into your high sleeper bed. You can choose one with ready installed options or go for a standard high sleeper which would allow you to add in your own furniture. If the purpose for choosing a high sleeper bed is primarily for studying, there are various high sleepers with desks; from singular desks to corner desks with wardrobes and drawers. There are options to include bookcases and sofa beds. For the best of both world’s it’s possible to choose a smaller desk with a sofa built in, offering ultimate practicality and comfort. Shop high sleeper beds with Room to Grow today. High sleeper beds are recommended for children over 6, but one of our mid sleeper beds might be the perfect alternative option. 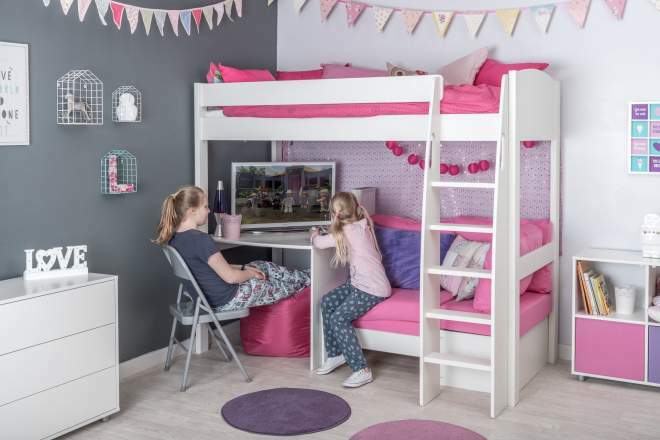 The stairs do differ by design and if you are concerned about safety Room to Grow offer high sleeper beds with deeper, larger staircases which are safe and practical for younger children, over 6 whilst also offering a stylish, modern finish to the bed. With endless design and storage options you will be sure to find a high sleeper bed which is ideal for any child, but for more information take a look at our guide all about the various benefits and features of Mid Sleeper & High Sleeper beds. From cabin beds to children’s double beds, we guarantee you’ll find the perfect children’s bed with Room to Grow today.